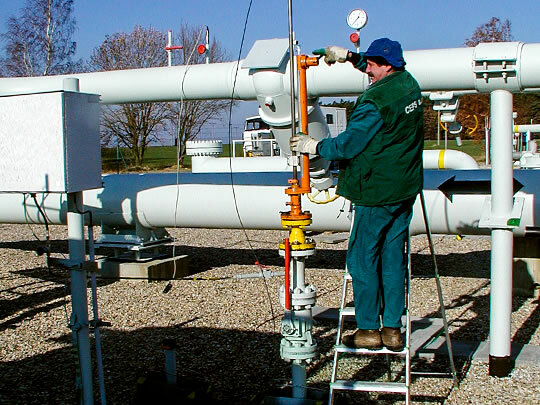 Measurement of flow parameters of the Czech transit system — CEPS a.s.
RWE Transgas Net, s. r. o. In the years 1983–2007, using the procedures and equipment that we designed, were measured six lines of the Czech transit system in total length of 2,100 km and dimensions DN 800, DN 900, DN 1000 and DN 1400. The data obtained by operator provided detailed information about the values ​​of hydraulic resistance of individual sections of all lines of the system, its development in the cycle between operational cleaning and other related information, such as the influence of condensates, which occurred in the pipelines earlier. 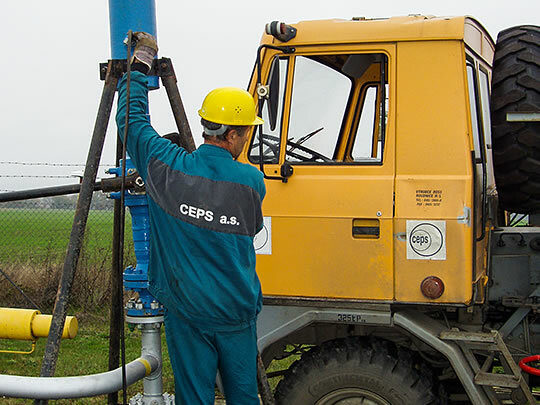 The measurement technology of hydraulic parameters of high-pressure pipelines for transportation of natural gas has been developed by our employees in the early eighties of the last century. The primary objective was to verify and refine then used constants for the hydraulic calculation of pipeline of the Czechoslovak transit system, linking the Soviet Union with the two German republics and Austria. First was developed the idea of measurement, consisting of the measuring of all quantities of the basic flow equation and whereas for measuring of the gas flow rate in gas pipeline was selected the injection method using the marking substance at the beginning of the measured section and its detection at the end point. There was carried out the sensitivity analysis of the result on the accuracy of measurement or on calculation of the individual quantities and the required accuracies of measuring instruments were derived from. As marking substance was chosen after many considerations and experiments hydrogen and it was designed and manufactured device detecting trace concentrations of hydrogen based on thermal conductivity detector. The amount of injected hydrogen has to be so small that it does not affect the combustion characteristics of the natural gas, and so the demands on the sensitivity of detection equipment are more challenging. The injection equipment for spraying hydrogen marking into the gas stream under the operating pressure was made, whereas the volume of the marking is 6 m³ (measured under normal conditions) and the mark is injected into the pipeline within 0.1 s so as the hydrogen mark was the closest and the concentration boundary line the sharpest. It was also necessary to develop and produce equipment for continuous sampling of gas from the pipeline axis level, which is inserted into the pipeline that is operating at full operating pressure of 76 bar. The first measurement was performed on the 12 October 1983 on 23 km long section of the pipeline DN 900 at an operating pressure of 51 bar. The multiple injection and detection of marking allowed the multiple calculation of the friction coefficient of the existing pipe section. An extremely narrow dispersion of the obtained results demonstrated a very good reproducibility of the method. The next steps were to verify the applicability of the method for longer sections of the pipeline, which showed that hydrogen mark is detected even after passing through the 100 km long section of the pipeline DN 1000. In years 1984, 1985 and 1986 took place a long-term programme of the regular measurement on one section of the line DN 900. The aim of this programme was to obtain knowledge in the development of hydraulic resistance in the period between regular cycles of operating cleaning provided by pigs. Measurements were carried out regularly on a monthly basis and in period around the operating cleaning was always performed daily measurement throughout the period – one week before and one week after the operating cleaning. These measurements allow assessment of the effectiveness of a single course of cleaning and so to optimize the period of operating cleaning. After putting the line DN 1400 into operation in the year 1986, the applicability of the method was successfully verified even on pipeline of this so far the largest used dimension. Subsequently a set of measurements on the lines DN 1400, DN 1000 and DN 800 was carried out, by which were obtained relevant values that could be used both for designing and especially for operational modelling of the pipeline within the transit system. Another set of measurements was conducted in years 1996, 1997 and 1998. The aim of these measurements was to discover how the hydraulic parameters of the gas pipelines of transit system have changed after many years of the operation. In years 2002 and 2003 were measured two lines DN 1000, one of which was equipped with an internal coating (460 km) and the second one (420 km) was not. The aim of the measurement was to verify, whether and to what extent the hydraulic parameters of the line with internal coating were better than in the case of uncoated line. This information is essential for the designing of new lines built afterwards. In the year 2004 was measured the line DN 800 and in the year 2005 the line DN 1400, both lines in the length of 460 km. In total six lines of the Czech transit system in overall length 2,100 km and dimensions DN 800, DN 900, DN 1000 and DN 1400 were measured. The technical measuring equipments have been over time gradually improving. For pressure measuring, whose precision is crucial for the final accuracy of the result, were at the start used the precise pointer pressure gauges with the accuracy of 0.1 bar, later on the dead-weight pressure gauges and finally were specially developed electronic measuring recorders of the temperature and pressure, in the first generation with the accuracy of 0.05 bar and 0.1 °C, and finally in the second generation with the accuracy of 0.01 bar and 0.05 °C. For the detection of hydrogen marks were developed another two generations of devices, the last of which provides the control and data recording by microcomputer. Optimized was also the sampling line itself, in which it was managed to shorten the dead time by 90% to 10 seconds. The obtained data gave operators detailed information about the values of hydraulic resistance of individual sections of all lines of the system, about its development in the cycle between operational cleanings and other supporting information, such as the influence of condensates, which were to be found in the pipelines in the mid-eighties.